Working together we developed a true 3D data model of the ocean—at a spatial resolution of 1/4 degree by 1/4 degree by varying depth to match the NOAA World Ocean Atlas, which resulted in a mesh of over 50 million points—and 3D data visualization tools to go along with the data. As part of this we also developed a statistical clustering methodology for identifying the physiographic structure of the water column based initially on temperature, salinity, dissolved oxygen, and nutrients—i.e., the usual suspects that will likely drive ecosystem responses. This methodology has been developed by Esri’s Kevin Butler and vetted by distinguished spatial statistics professor Noel Cressie of the University of Wollongong in Australia. 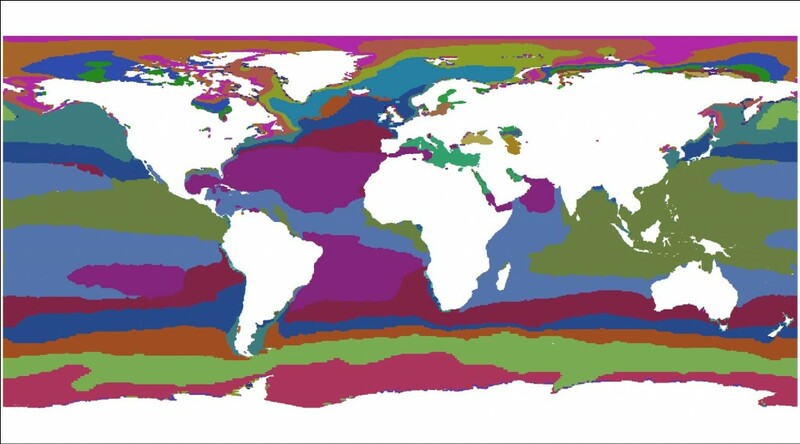 We will then be able to connect that information to species distributions (initially from the Ocean Biogeographic Information System or OBIS), biogeographic realms, and seabed habitat and biotopes representing the response of these ecosystems to the physical setting (e.g., the biological distribution/response to ocean acidification). The Group on Earth Observations (GEO) officially commissioned the project as a means of developing a standardized, robust, and practical global ecosystems classification and map for the oceans. GEO is a consortium of almost 100 nations collaborating to build the Global Earth Observation System of Systems (GEOSS). The EMU project is seen by GEO as a key outcome of the GEO Biodiversity Observation Network (GEO BON) and the new GI-14 GEO Global Ecosystems Initiative (GECO). EMUs rendered at the top of the water column. Why is it important that this map be 3D? A map of marine ecology that is fully 3D and covers all of the oceans will make it possible for users to navigate through the ocean and observe what is happening to a wide range of ocean parameters such as salinity and oxygen levels as you explore from the surface down to the ocean floor. Thanks to the great work of Esri’s Sean Breyer, Chris Malke, Keith VanGraafeiland, and others we have a new web app called the EMU Explorer. It allows users to explore each of the ocean parameters involved in the EMU clusters by way of a horizontal plan view of those clusters at the ocean’s surface, as well as a vertical profile showing how the parameters change with depth. In the future we envision a 3D visualization app that allows the user to virtually “swim” through various environments seamounts, mangroves, and coral reefs while observing the statistical clustering and hence classification of many physical properties as matched to species distributions. In this way we hope to better understand how the physical ocean environment structures marine biodiversity. What might people do with the Ecological Marine Units map? The map can be a huge benefit to many potential applications, but one great example is marine protected areas (MPAs). We hope that the MPA community can use the map to better access knowledge of ecosystems that will in turn inform ocean conservation and ecosystem based management. We hope that the map will allow for ocean health monitoring and climate change resilience, for mapping out ecosystem goods and services and selecting the best places for MPAs within a representative network. It may inform the MPA community in deciding whether existing MPAs need to expand to cover relevant biological or geochemical features (such as salinity, temperature and acidity). The EMUs might ultimately assist with identifying restoration options for fisheries (pelagic and reef) or mammals within existing or planned MPAs. As example for the ELUs, which are much simpler, we have classified 3923 unique units, based on combinations of bioclimate, landform, rock type, and land cover (e.g., “warm wet plains on metamorphic rock in most deciduous forest”). In the ocean we might have something such as “deep, cold, hypoxic, euhaline, over abyssal plains.” This is still very much a work in progress. The EMU map and underlying data will be made available to all, and it will be easy to overlay your own data such as fisheries or shipping. In addition, Esri will make it easy for you to leverage the data in relevant apps such as Story Maps, to tell the story about why we need to protect our ocean. Are there future plans for the Ecological Marine Units map? The EMU map is still very much a prototype so we are still seeking input from additional ocean scientists around the world as we move it forward to completion later this year. As such, we welcome them to check out the EMU Explorer and to give us some feedback. In the future, we will welcome all those in the oceans community to contribute additional higher resolution data for their own specific study area. This will help us to improve the global map. A map such as this is dynamic, and will thus never be finished, as we will always need to add new and better datasets as they become available. And given that the map is being prepared at a global scale, it won’t initially contain every habitat or spawning area that people may be aware of, but we hope that ocean scientists, managers and conservationists will be open to applying our clustering and mapping algorithms to their own data over smaller regions. So make sure you stay tuned, via the Esri web site and via a forthcoming series of journal articles (TBA) to see how the EMU map becomes even more refined over time. Note also that we’ve been talking mainly about the deep ocean. The nearshore or coastal zone will necessitate creation of a special subset of the EMU, which we will likely refer to as the global Ecological Coastal Units (ECU) map. This will require us to connect as seamlessly as we can with the Ecological Land Units at that land-sea interface, to take into account wave energy and a wide range of coastal ecosystems (mangroves, reefs, etc. ), to account for vertical datums at the shoreline, and certainly to work with data at higher resolutions. USGS has extracted a new 30-m resolution global shoreline vector from Landsat imagery and will work with Esri’s Dabney Hopkins and others to refine it and add ecological attributes such as terrain and substrate types. Again, stay tuned!